In physics, the mean free path is the average distance travelled by a moving particle (such as an atom, a molecule, a photon) between successive impacts (collisions), which modify its direction or energy or other particle properties. The following table lists some typical values for air at different pressures at room temperature. Mean free path for photons in energy range from 1 keV to 20 MeV for elements with Z = 1 to 100. The discontinuities are due to low density of gas elements. Six bands correspond to neighborhoods of six noble gases. Also shown are locations of absorption edges. In X-ray radiography the calculation of the mean free path is more complicated, because photons are not mono-energetic, but have some distribution of energies called a spectrum. As photons move through the target material, they are attenuated with probabilities depending on their energy, as a result their distribution changes in process called spectrum hardening. Because of spectrum hardening, the mean free path of the X-ray spectrum changes with distance. Sometimes one measures the thickness of a material in the number of mean free paths. 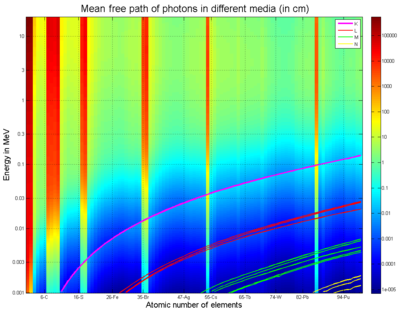 Material with the thickness of one mean free path will attenuate 37% (1/e) of photons. This concept is closely related to half-value layer (HVL): a material with a thickness of one HVL will attenuate 50% of photons. A standard x-ray image is a transmission image, an image with negative logarithm of its intensities is sometimes called a number of mean free paths image. is the mean free time, m* is the effective mass, d is the mean free path, and vF is the Fermi velocity of the charge carrier. The Fermi velocity can easily be derived from the Fermi energy via the non-relativistic kinetic energy equation. In thin films, however, the film thickness can be smaller than the predicted mean free path, making surface scattering much more noticeable, effectively increasing the resistivity. Electron mobility through a medium with dimensions smaller than the mean free path of electrons occurs through ballistic conduction or ballistic transport. In such scenarios electrons alter their motion only in collisions with conductor walls. where Qs is the scattering efficiency factor. Qs can be evaluated numerically for spherical particles using Mie theory. where V is volume of the cavity, S is total inside surface area of cavity and F a constant related to the shape of the cavity. For most simple cavity shapes F is approximately 4. This relation is used in the derivation of the Sabine equation in acoustics, using a geometrical approximation of sound propagation. where ℓ is the mean free path, n is the number of target particles per unit volume, and σ is the effective cross-sectional area for collision. where σ is the area (or, more formally, the "scattering cross-section") of one atom. 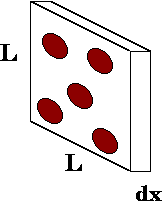 , where x is equal to the thickness of the slab x = dx. where m is the molecular mass, and μ is the viscosity. These different definitions of the molecular diameter can lead to slightly different values of the mean free path. In particle physics the concept of the mean free path is not commonly used, being replaced by the similar concept of attenuation length. In particular, for high-energy photons, which mostly interact by electron–positron pair production, the radiation length is used much like the mean free path in radiography. Independent-particle models in nuclear physics require the undisturbed orbiting of nucleons within the nucleus before they interact with other nucleons. The effective mean free path of a nucleon in nuclear matter must be somewhat larger than the nuclear dimensions in order to allow the use of the independent particle model. This requirement seems to be in contradiction to the assumptions made in the theory ... We are facing here one of the fundamental problems of nuclear structure physics which has yet to be solved. ^ Brünglinghaus, Marion. "Mean free path". European Nuclear Society. Retrieved 2011-11-08. ^ Jennings, S (1988). "The mean free path in air". Journal of Aerosol Science. 19 (2): 159. Bibcode:1988JAerS..19..159J. doi:10.1016/0021-8502(88)90219-4. ^ Based on data from "NIST: Note - X-Ray Form Factor and Attenuation Databases". Physics.nist.gov. 1998-03-10. Retrieved 2011-11-08. ^ Hubbell, J. H.; Seltzer, S. M. "Tables of X-Ray Mass Attenuation Coefficients and Mass Energy-Absorption Coefficients". National Institute of Standards and Technology. Retrieved 19 September 2007. ^ Berger, M. J.; Hubbell, J. H.; Seltzer, S. M.; Chang, J.; Coursey, J. S.; Sukumar, R.; Zucker, D. S. "XCOM: Photon Cross Sections Database". National Institute of Standards and Technology (NIST). Retrieved 19 September 2007. ^ Mengual, O.; Meunier, G.; Cayré, I.; Puech, K.; Snabre, P. (1999). "TURBISCAN MA 2000: multiple light scattering measurement for concentrated emulsion and suspension instability analysis". Talanta. 50 (2): 445–56. doi:10.1016/S0039-9140(99)00129-0. PMID 18967735. ^ Young, Robert W. (July 1959). "Sabine Reverberation Equation and Sound Power Calculations". The Journal of the Acoustical Society of America. 31 (7): 918. Bibcode:1959ASAJ...31..912Y. doi:10.1121/1.1907816. ^ Davis, D. and Patronis, E. "Sound System Engineering" (1997) Focal Press, ISBN 0-240-80305-1 p. 173. ^ S. Chapman and T. G. Cowling, The mathematical theory of non-uniform gases, 3rd. edition, Cambridge University Press, 1990, ISBN 0-521-40844-X, p. 88. ^ "Mean Free Path, Molecular Collisions". Hyperphysics.phy-astr.gsu.edu. Retrieved 2011-11-08. ^ Cook, Norman D. (2010). "The Mean Free Path of Nucleons in Nuclei". Models of the Atomic Nucleus (2 ed.). Heidelberg: Springer. p. 324. ISBN 978-3-642-14736-4. ^ Blatt, John M.; Weisskopf, Victor F. (1979). Theoretical Nuclear Physics. doi:10.1007/978-1-4612-9959-2. ISBN 978-1-4612-9961-5.